Tool and mold makers count on General Plastics for superior-quality LAST-A-FOAM® machinable foam, polyurethane molds, and pattern-to-tool capabilities. Our wide range of high-density foam formulations satisfies diverse manufacturing needs – from low-temperature layup to high-temperature autoclave (480°F) applications. Uniform, grain-free and highly machinable, LAST-A-FOAM® tooling boards are ideal for master models, check fixtures, rapid prototypes, mold and foundry patterns, master-plugs, and composite tooling. Our rigid tooling foam boards bond securely and easily using a variety of adhesive systems. Their excellent bonding ability allows you to create monolithic tools and polyurethane foam molds necessary for building large-scale projects. Substituting LAST-A-FOAM® for metals offers significant cost savings on prototype development prior to building the final metal tool. It is also much more affordable for limited-run tooling where metals are cost-prohibitive. 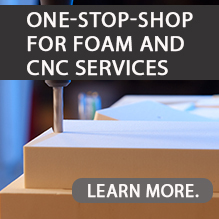 Look to our rigid polyurethane foam products and fabricated parts to fulfill your tooling and mold applications. We can supply you with specified tooling foam material, or create prototypes and CNC-machined molds from your designs and specifications. Our knowledgeable customer service and CNC teams are here to support your project from concept to completion. Custom sheet sizes and formulations of rigid foam for machining are also available. Beyond making foam molds for short-run composite tools highly affordable, General Plastics’ FR-4800 high temperature, low CTE tooling board offers outstanding stability and versatility. Its higher glass transition temperature and low coefficient of thermal expansion (CTE) makes it suitable for use in vacuum-forming applications where other urethane products may soften or deform. Read this case application to learn how General Plastics’ Tooling Boards and Machining Services helped improve a pool feature.